Andrew Garfield played a Jesuit in Silence, but he didn't expect to fall in love with Jesus. 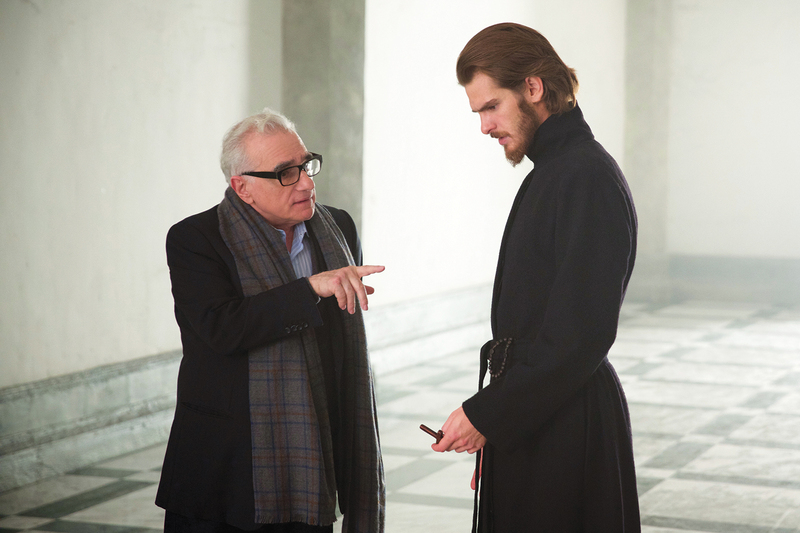 “Films were really my church,” Andrew Garfield, pictured here with the director Martin Scorsese, said of his childhood, “that is where I felt soothed, that is where I felt most myself” (photo: Paramount Pictures). Father Martin was hesitant at first. But Garfield was looking for something. Or someone. And that’s not a bad reason at all. In the end, it was enough for Jim. And more than enough for God. It was a rainy day in Los Angeles when I had lunch with Garfield to talk about his experience of the Exercises. We met in a small bustling restaurant in Los Feliz, an old L.A. neighborhood that sits below the iconic Griffith Observatory just east of Hollywood. I was early. He was on time. We were both hungry. Garfield seemed weary. It was just past noon when we met, and he was tired. He had been working for weeks, promoting two movies, filming a third and preparing to return to London for an upcoming stage production. He carried a small collection of notebooks and a phone. Add a laptop and cup of coffee and you might have confused him for a grad student. It was New Year's Eve, and he was having lunch with a spiritually curious Jesuit whom he had never met before. Not exactly the glamorous Hollywood life one would expect. More like an awkward religious blind date. I could appreciate the weariness. Yet even in his fatigue he was exceedingly kind, generous with his time and thoughtful in his conversation. He made sure we were going to eat. He ordered the polenta, and I the blueberry pancakes. He was tired but grateful—grateful for the chance to recall his year-long experience of making the Exercises with Father Martin, grateful to get back into a place of greater depth and consolation than he was in at the moment—a place of Hollywood self-promotion. “This is like the marketplace of ‘riches, honor and pride,’” he said, referencing, unprompted, a key meditation from the Spiritual Exercises. It was a keen insight and a nice touch. He was speaking my language. He made me feel at home. St. Ignatius Loyola was similarly transported when he began writing the Spiritual Exercises. After a grave failure, wounded while foolishly trying to play the hero during a hopeless battle, with nothing like an endless newsfeed to occupy his time during a long and painful recovery, Ignatius began to read. He soon came to realize that the consolation he was looking for, the healing he needed, was not to be found in the fantasies of chivalrous fiction but rather in the lives of the saints. Moreover, he came to realize that a deeper and more satisfying life was being revealed not only in their saintly example but in the intricacies of his own passions. The wounded reality of his inner life became a place of graced imagination. Ignatius’ conversion began when he became sensitive to the complexity of his own interiority. In my conversation with Garfield, it became abundantly clear that he shares this Ignatian sensitivity. It was also clear that his “vast inner landscape” is, like many of ours, full of wounds and vulnerability. He knows well the longing for love, and at times, it is a torturous longing. He repeated this thought at various moments in the few hours we were together. His life has been taken up by the burdens of love, by the possibility, or impossibility, of real love. Andrew Garfield was, for lack of a better word, successful in the Exercises. “There were so many things in the Exercises that changed me and transformed me, that showed me who I was...and where I believe God wants me to be,” he told me. That’s about as good a retreat outcome as one can hope for. And his success should not surprise us. His training as an actor prepared him well for the dynamics of Ignatian prayer, whereby one imagines oneself within a series of biblical scenes in order to attain “interior knowledge” of God and to articulate that knowledge in a life of compassionate action and generous service. What was more surprising, what surprises him still, was falling in love. Many of us live with a fear of failure, but what we don’t often realize is that it is not the failure that bothers us; it’s the exposure. It’s not hard to fail; we do it all the time. It’s that people will see us failing. It’s that we will be recognized as a failure that really pains us. When all we want is appreciation, being seen is what we long for; if we fear we’re not worthy of it, it’s being seen that terrifies us the most. This tension is something that Andrew Garfield understands very well. He has lived ever since with this same creative tension—with a deep fear of being seen and an even deeper need of it. If it is being seen in our imperfection that terrifies us, it is being held in our vulnerability that will redeem us. Among the most moving parts of the Exercises for Garfield were the contemplations on the so-called “hidden life” of Jesus. “That felt very important,” he recalled. “Where I’m tempted constantly to be producing, to be seen, to be appreciated, etc., I was shown the beauty of living a hidden life, of retreating in order to offer myself in a deeper way to my art, to my life, to the world.” Considering his evident discomfort with the trappings of celebrity, an attraction to a hidden life is not surprising. And yet, these meditations on the childhood of Christ also revealed a desire to enter into the hidden parts of his own life—into his wounds of not-enough-ness, into the desolate places we all carry with us, but don’t often find a way into or out of. Yet perhaps the most critical exercise for Garfield was not about the hidden life, and not about his own woundedness, but rather about something sacred being revealed, about the vulnerability of God. During the meditation on the Nativity, he imagined himself, as Ignatius recommends, a nurse during the birth of Christ: “I felt at home there. I felt like that was where I was meant to be. In service of this woman doing this profound act.” He began to appreciate how the antidote to humiliation might just be humility. “God, I wish I could feel like that all the time, in humble service,” he said. “If I can make storytelling a service, if I can be of service, and be as humble as I possibly can while doing it...” He loses himself again in the memory of the moment. And I don’t blame him. This is no small thing. Actors have been understood as midwives from the beginning of time. The actor, as with all priestly people, stands before the truth and participates in its telling by way of their words and gestures, by enacting our sacred stories of redemption and love. In contemplating the birth of Christ, Garfield came to know something that other midwifing actors and mystics have known for a long time—that it is by our personification of love, by our humble service, that we become the love for which we long. The experience of the Exercises is sacred because it is a place where we come to know the truth of love, where the personification of love is revealed in Christ. Feeling yourself participate in the labor of birthing into the world the love you long for is a mystical moment for any of us. It is not easy. It is in every sense an exercise and more. But it is without a doubt the greatest gift. Yet this midwifing of love into the world does not excuse us from the pain of labor. It is not the possibility of love that remedies its impossibility, but rather, it is the personification of love that redeems us in the end. It is the labor of love that saves us. It is, in every sense, a work in progress. If Garfield seemed weary when we first met, he’s far from weary now. As he recounts these graces received he is visibly joyful, laughing out loud. Even as he acknowledges that some will think him “worthless” he seems radiant and free. At their core, the Spiritual Exercises are about the personification of love, not the possibility of it. The possibility of love, or its impossibility, paralyzes us. But the personification of love, the vulnerable, wounded, beaten love that I saw in the heart of Andrew Garfield, the personification of love that he experienced as a midwife to Mary, the love he guards in his “hidden life,” the love that lives in his longing to be seen deeply and appreciated fully, the falling in love that he continues to struggle with in his own relationships to God and others—that personification of love is what redeems us all in the end. If the impossibility of love leaves us longing, it is in the personification of love that we will find our satisfaction. It is in the personification of love where we will discover our enoughness. Wow, it hit my heart. A journey of life, God never stops surprising. This is a wonderfully written article that I really enjoyed. Thank you Father Busse. This is one of the most meaningful and moving interviews I have ever read. And of the most insightful in terms of the consonance of the Exercises and artistic practise. In an age of shallow bulls***t in contemporay culture, this article was like water in the desert. Incredibly inspirational and a real grace from God. Thanks. AMDG! In addition to being a wonderful story, this article was very beautifully written. Does this author have any books or other articles? It was a blessing. Thanks. Thanks Kelly. You're very kind. I haven't put a book together (yet) but I have been writing for the last few years over at TheJesuitPost.org. Here's a link to my author page over there: https://thejesuitpost.org/author/bbussesj/ Thanks for reading! This article also appeared in print, under the headline "Grace Enough," in the January 23, 2017 issue. Brendan Busse, S.J., a contributing writer for America, is currently studying theology in Madrid, Spain.